Most people know what “panniers” are (the wide skirt supports we all think of when we picture Marie Antoinette in her WIDE formal gowns). During the Georgian era in England, they were simply known as “hoops” and they took many forms, from the full, round hoops of the 1730s (very Scarlet O’Hara, though 100+ years earlier) to the wide, but flat hoops of the 1760s (which are collapsible, so the lady could lift them, tuck them under her elbows, step through the doorway, and then let them back down), to the smaller “pocket hoops” of the 1770s. To the left, you can see a pair made of bent willow cane. 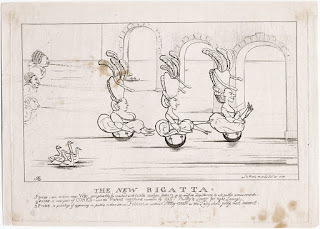 What a lot of people aren’t familiar with are the false rumps of the 1780s. These could be stuffed, like a cushion, or they could be made of cork. 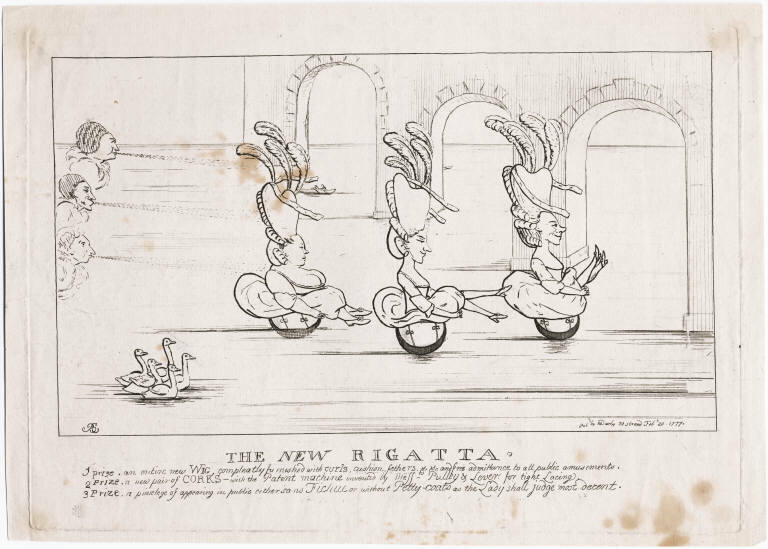 The use of cork led to some rather amusing cartoons of women being used as shuttlecocks or racing down the Thames balanced on them like tiny boats. To the right is my favorite, The New Rigatta. In the late 1790s, when gowns go Grecian, there was still a small moon-shaped pad at the “waist” which was there to hold the gown out away from the body and the small of the back and to help keep it from forming to the lady’s posterior. 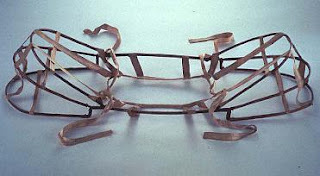 These were used well into the Regency period, up until the 1820s when the high-waist dropped down to the natural waist and petticoats became fuller, obviating the need for them. Of course then they simply move to the arms, where they are stuffed with down and used to hold out the large, ridiculous sleeves of the late 1820s and 1830s. Terrific post, Isobel. 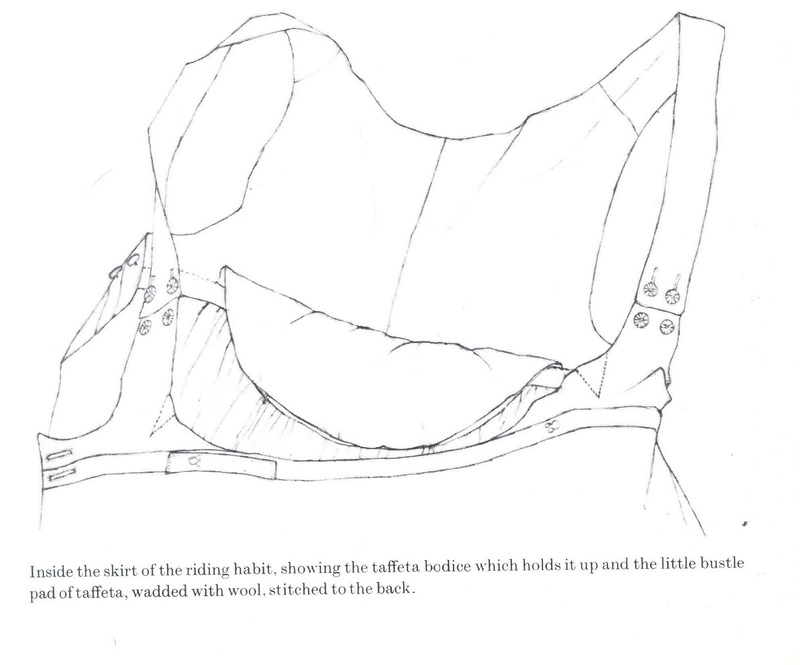 I did know about the cork rumps, and all the padding from the Georgian era, as I came across it in my (Amanda Elyot's) research for TOO GREAT A LADY, my Emma Hamilton novel. 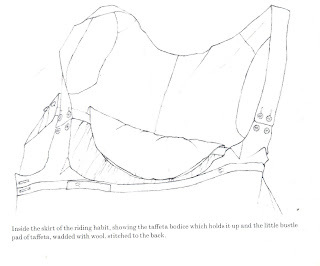 I still wish I could see some of these underpinnings, especially the cork rumps, in person. Are there any museum collections in the U.S. with comprehensive period lingerie collections that they will allow individual researchers (i.e. authors) to visit?